Let and be complex velocity potentials corresponding to distinct, two-dimensional, irrotational, incompressible flow patterns whose stream functions are and , respectively. 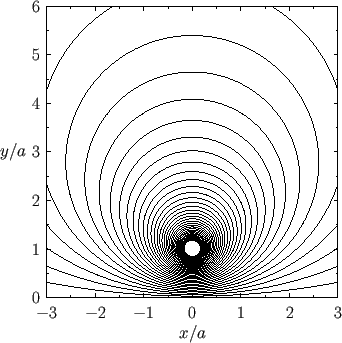 It follows that both stream functions satisfy Laplace's equation: that is, . Suppose that . Writing , it is clear that . Moreover, , so also satisfies Laplace's equation. We deduce that two complex velocity potentials, corresponding to distinct, two-dimensional, irrotational, incompressible flow patterns, can be superposed to produce a third velocity potential that corresponds to another two-dimensional, irrotational, incompressible flow pattern. As described in the following, this idea can be exploited to determine the flow patterns produced by line sources and vortex filaments in the vicinity of rigid boundaries. 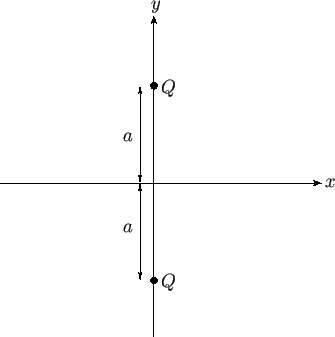 Figure 6.1: Two line sources. Note that , which implies that there is zero flow normal to the plane . Hence, in the region , we could interpret the previous stream function as that generated by a single line source of strength , located at the point , , in the presence of a planar rigid boundary at . This follows because the stream function satisfies everywhere in the region , has the requisite singularity (corresponding to a line source of strength ) at , , and satisfies the physical boundary condition that the normal velocity be zero at the rigid boundary. Moreover, as is well-known, the solutions of Laplace's equation are unique. The streamlines of the resulting flow pattern are shown in Figure 6.2. Incidentally, we can think of the two sources in Figure 6.1 as the ``images'' of one another in the boundary plane. Hence, this method of calculation is usually referred to as the method of images. 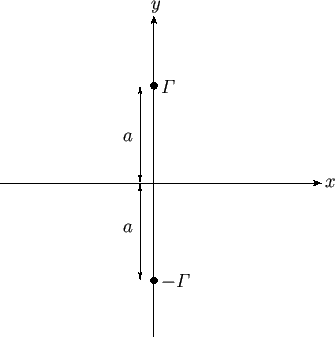 Figure: Stream lines of the two-dimensional flow pattern due to a line source at , in the presence of a rigid boundary at . The fact that the force is positive implies that the boundary is attracted to the source, and vice versa. Figure 6.3: Two vortex filaments. As before, , which implies that there is zero flow normal to the plane (because the plane corresponds to a streamline). Hence, in the region , we could interpret the previous stream function as that generated by a single vortex filament of intensity , located at the point , , in the presence of a planar rigid boundary at . 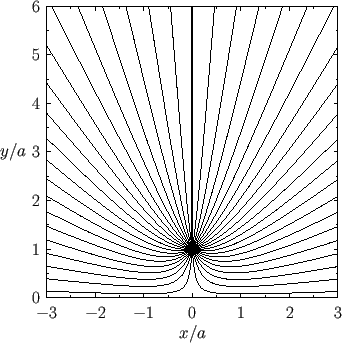 The streamlines of the resulting flow pattern are shown in Figure 6.4. We conclude that a vortex filament reverses its sense of rotation (i.e., ) when ``reflected'' in a boundary plane. Figure: Stream lines of the two-dimensional flow pattern due to a vortex filament at , in the presence of a rigid boundary at . The corresponding streamlines in the region external to the cylinder are illustrated in Figure 6.6. Figure 6.5: A line source in the presence of an impenetrable circular cylinder. 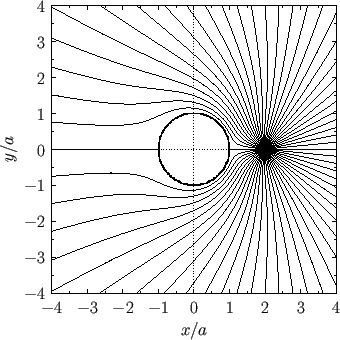 Figure: Stream lines of the two-dimensional flow pattern due to a line source at , in the presence of a rigid circular cylinder of radius centered on the origin.